I look forward to capturing the natural beauty of your family, the magic of your pregnancy, the special moments with your newborn, the whimsical smiles of your children, and the romance shared with your partner. 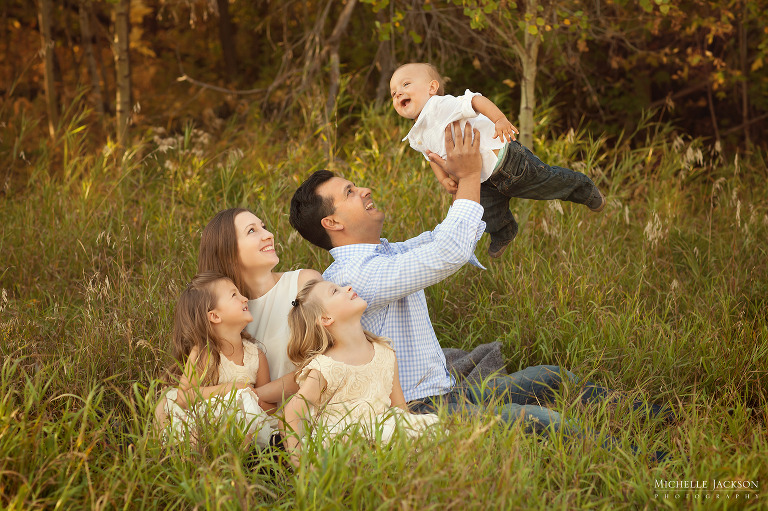 I am an Edmonton newborn, maternity, baby, and family photographer with over 6 years of professional experience. I offer custom fine art photography. I have completed years of training in newborn safety, posing, lighting, and editing to provide my clients with the high-quality custom work they deserve. If you are searching for a custom newborn baby photographer in the Edmonton area, I would be happy to discuss my process with you! 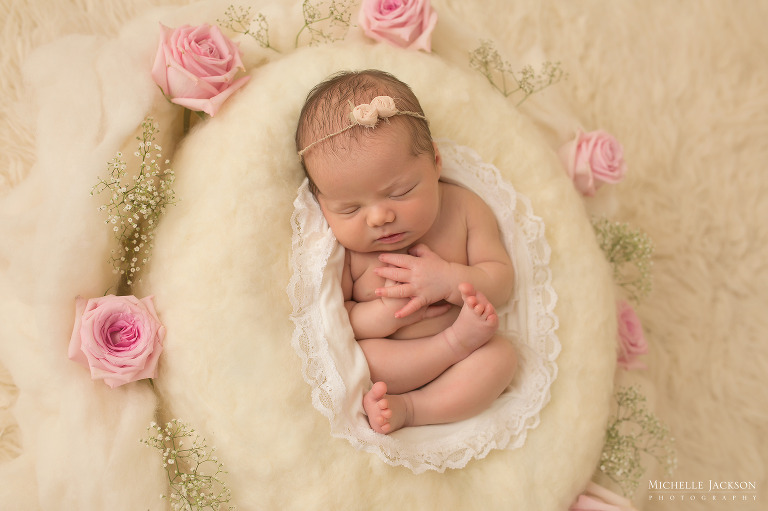 I have been trusted by many families in the Edmonton area to capture their precious newborn. My passion has allowed me to photograph over 200 newborns! I absolutely adore each session and the honour that comes with being chosen to capture such a special time in my client’s lives. My newborn sessions feature styling, posing, and props that are colorful and timeless, yet organic and natural. My goal is to have the imagery complement your beautiful newborn and not distract with enormous props that overwhelm the baby. I focus on the tiny and fresh features of the baby, the bond of the new family, and the excitement to be beginning a new chapter together. It’s important to capture the family together in the first few days! Older siblings are always welcome to join in the session and be photographed with their new brother or sister. My Leduc studio is stocked with beautiful props for my clients to choose from, as I feel it’s incredibly important to include the parents in the styling of the newborn session. There is comfortable seating to relax in while I focus on capturing all the tiny, adorable features of your new baby! After your baby is photographed, my custom hand editing and portrait retouching is applied to each photo to make each image a work of art you will be proud to display in your home for years to come. Celebrating the birth of a baby is one of life’s most precious moments! Please contact Michelle Jackson Photography today to book your newborn’s custom photography session. I specialize in maternity photography. 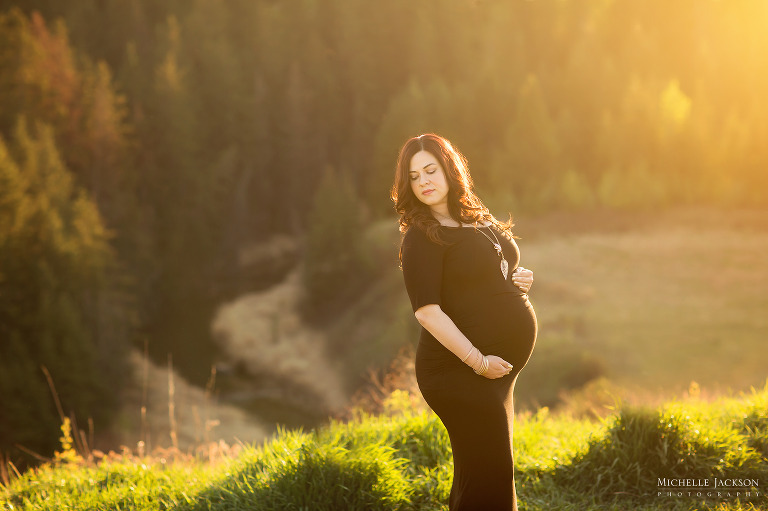 My maternity photography sessions focus on the excitement of the baby’s arrival, the undeniable beauty of the mother during this special time, and the love shared between the expecting parents. Sessions occur either outdoors or in my Leduc studio. Maternity clients are welcome to use one of my flowing pregnancy gowns to complement their beautiful belly. Siblings are always welcome to join in, as it’s an exciting time for them as well! My style is rich and vibrant, and my eye-catching images possess a style that is hard to miss. Photos of your family are a treasure that you will never regret investing in. Whether you are just starting out as a young family, or whether your children are all grown, the images I create will bring a smile to your face as you enjoy them for years to come. My family photography sessions are fun and relaxed, and the images produced are classic, timeless, and beautiful depictions of a moment in time shared by your family. I have photographed all sized of families-even up to 40 people at once! Let’s celebrate your child’s first birthday in style! I offer custom cake smash photography with many packages to choose from to suit your needs. There are options to include formal ‘clean’ portraits of your birthday boy/girl, family and sibling photos, and a bubble bath for clean up after the cake smash. I’m excited to announce that I now offer in-studio milestone sessions for babies and children! These sessions are great for babies/children ages 3-12 months old. My clients select backdrops and props from my large collection to style the session with. I love photographing children and I enjoy creating images that the entire family will love to look back on! If you are searching for an experienced, high-quality Edmonton-area photographer please contact Michelle Jackson Photography today! I am located in Leduc and service Edmonton, Sherwood Park, St. Albert, Beaumont, Devon, Millet, Wetaskiwin, and Spruce Grove. I can also be reached by phone at (780) 246-0060. My studio is located at 9 Selkirk Place in Leduc.